Hola!! A bit of a break from introducing kinds of sushi and Mika-sensei is posting this entry! Now is a sushi-making competition between me and Javi-sabi! Firstly, let me briefly explain the whole procedure. Hope this would help when you make sushi in your own local area. This is what I used in my recipe. I always use sushi rice that is small and short in size comapred to the one you guys use for paella and stikier than any kinds of rice, which is suitable for sushi. 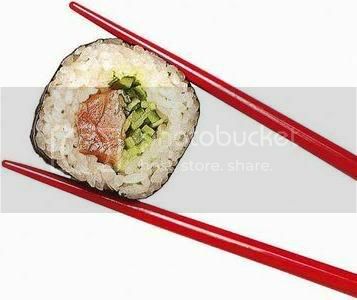 Try to find Japanese rice when you make any sushi. I am pretty sure that you can find it in oriental section of the supermarket? Two bottles are Rice Mirin and Rice Vinegar. You can substitute them with white wine and a vinegar you can get in your local store. This is a rice cooker that I - well, Javi-sabi gave this to me! - got in England. You can cook rice in 15-20 minutes, which is very quick!! Make the thinnest crepe with eggs with quite a lot of sugar. Be careful not to burn it as anything which contains some sugar gets burnt easily! Flip it over after a few minutes! Cut it half and make thin strips on a cutting board. Cut the pork stake into strips and cook them with some soy sauce and some ginger. I used a tube of ginger, but you can of course use a real ginger. Here is all the ingredients: avogado, pork, salmon, and sweet egg crepe. Now, get ready to roll them with nori! Cool down the rice and put some spoons of rice mirin, rice vinegar, and a bit of salt and sugar. Mix it well! Spread a sheet of nori, put some rice and ingredients like this. I put some pork steak strips and a bit of plum in this. Roll it slowly but quite firmly!